MR. HOLMES Review | Warped Factor - Words in the Key of Geek. Matthew Kresal meets the man beyond the myth. After more than a century of Sherlock Holmes stories in various media, it would seem that perhaps there was little else left to be said about the greatest fictional detective of our time. He has been resurrected, modernized and been seen through the eyes of generation after generation. Yet it's rare that Holmes himself is examined, given a character study of his own so to speak. 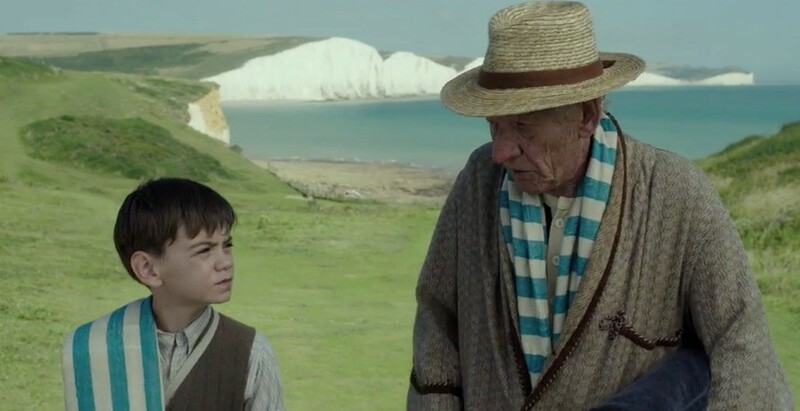 Perhaps redressing the balance a bit Mr. Holmes, Bill Condon's film from 2015, looks at the great detective in his later years piecing together memories of his last case. Much like Nicholas Meyer's famed The Seven Percent Solution (and its 1976 film counterpart), Mr. Holmes isn't the Sherlock Holmes tale you're likely expecting it to be going in. Indeed some of the trailers put significant emphasis on the case Holmes takes on as part of the film's plot. While there is a case there that is central to the film's plot as a 93 year old Holmes casts his mind and failing memory back to its events, that's not really what the film is about. Mr. Holmes instead presents a look at the detective, the seemingly cold and emotionless machine of a man, in retirement. What happens when a great brain likes Holmes' retires and what caused the world's greatest detective to become a beekeeper in Sussex? The mystery at the film's heart isn't a traditional Holmesian one but of a man in his old age trying to understand himself, to separate the man from the myth that has sprung up around him. If one can accept that, than you're in for a treat. Mr. Holmes features one of the most respectable screen incarnations of the character in recent memory. Sir Ian McKellen plays Holmes in his 60s via flashbacks and as his 93 year old self in the aftermath of the Second World War. McKellen's performance is breathtaking as we see him playing the detective in the midst of his final case and also an old man, dealing with most his advanced age and what his legacy will be. There's a warmth to McKellen's performance throughout, especially in the scenes where the elderly Holmes interacts with Roger, the son of his housekeeper. McKellen also brings that most crucial of elements in playing Holmes: a fierce intelligence, but one that, here at least, is mixed with a warmth missing in some versions of the character. For all that, perhaps the most intriguing elements to McKellen's Holmes is the sadness and regret, the sense of Holmes at 93 having lost his place both in the world and within himself, elements that we come to understand as the film unfolds. It's a fine performance and McKellen makes for an excellent Holmes. The supporting cast is solid as well. Looking after Holmes in his retirement are Mrs. Munro and her son Roger, played by Laura Linney and newcomer Milo Parker, who look at Holmes in very different ways with one taking care of him and the other becoming some a protege. Both have interesting, if quite different, chemistry with McKellen's Holmes and the scenes with McKellen and Parker especially are amongst the biggest highlights of the film. Featuring in the flashback sequences for Holmes last case are Patrick Kennedy as Thomas Kelmot and Hattie Morahan as his wife Ann who is a character who barely appears but casts a long shadow over the events of the film leaving a memorable appearance in the minds of both Holmes and viewer alike. Rounding out the cast are Hiroyuki Sanada as Holmes Japanese contact Tamiki Umezaki, as well as UK character actors Roger Allam and Phil Davis plus a delightful appearance by Frances de la Tour. Longtime Sherlock Holmes fans may get a chuckle out of a cameo appearance by Nicholas Rowe, who played the title role thirty years ago in Young Sherlock Holmes, at a neat moment in the film. The film also features some handsome production values as well. The combination of production design and costumes do a fine job of bringing to life the various locations from 1919 London to 1940s Sussex and even an excursion to post-war Japan. Indeed Mr. Holmes's depiction of Japan after the war, in the midst of recovery, gives the film some of its most haunting sequences. There's some fine cinematography as well from Tobias Schliessler and a subtle score from Carter Burwell that combines with the direction of Bill Condon to bring the film to life. Those going into Mr. Holmes expecting a full blown mystery are likely to be disappointed. Those willing to put that aside or go in with an open mind will find something else entirely to enjoy. 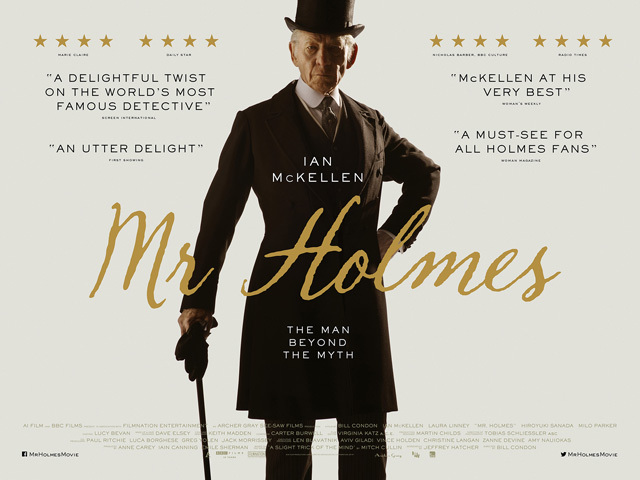 Mr. Holmes presents an intriguing, well acted and produced examination of one of fiction's greatest characters in his retirement trying to make sense of his past and to separate the fact from the fictions created up around him. The result is what might be called “a study in Holmes” and is all the better for it.